This is the second installment of our honeymoon diaries, simply because the experiences we had were far too many to pack into one single blogpost. We were still trying to decide whether the first 24 hours of our honeymoon were a bad omen, a sign for us to return home early. Or if we should stick it out after a freezing cold night in our hotel room, a power outage in the entire city, badly insulated rooms throughout the city and no willpower wanting to stay. A and I sat across from each other in our winter coats, our frozen fingertips gripping hot steaming cups of coffee, made by a coffeeshop that apparently was well prepared for power outages and had an emergency generator running, and while we faced each other, we also had to face the harsh reality that our honeymoon, if it continued like it has up to now, would be one unforgettable disaster. Afraid of making a decision that we would regret for the rest of our lives, we both stared silently into nothing while trying to keep warm. The thick snowflakes were relentlessly coming down and it looked as if the snow was trying to stay. 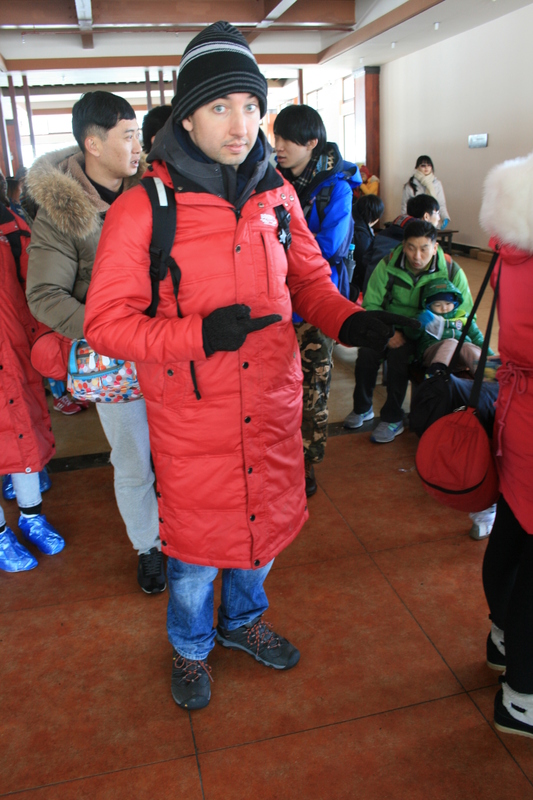 For many Chinese people this was the first time they ever saw snow and like children feeling sand on their tiny little feet for the first time while the ocean sweeps away little pebbles of sand, the excitement of the first snow could not be contained. I kid you not, I have never seen so many people taking pictures of snow before. Still undecided, we trotted back in silence to our paradise hotel, paradise if it were anywhere but in Lijiang. At this point the only sounds we would make would be long exasperated gasps. We stopped at a pharmacy to see if they had anything to make me feel better. The pharmacist took one pitiful look at me and gave me some mystical herbal pills (which tasted and smelled like the bits and pieces of fish that you usually throw out, but they worked wonders almost instantly). As we entered the hallway to our hotel, we realized that the electricity was back on. We returned to our room and stood in front of the heating unit for what must have been an eternity. 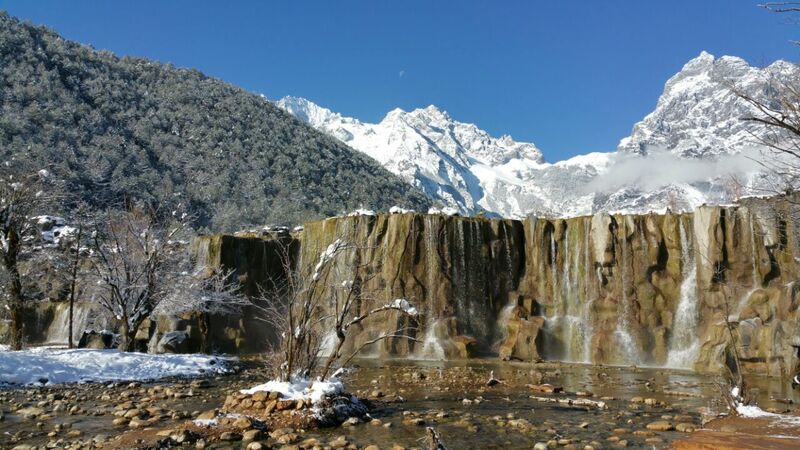 After a while A turned to me and asked, “so?” Back and forth we weighed the pros and cons of staying and then concluded, since we survived the first 24 hours without seriously getting injured or suffering from frostbite, we should be able to do a whole week in Lijiang. 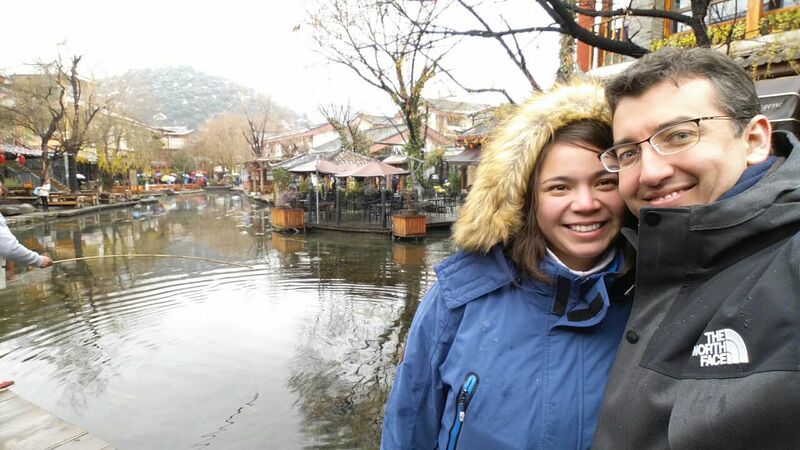 And since Lijiang is so very touristy, we quickly found out that there was a lot to do around Lijiang. And when I say touristy, I don’t mean Western tourists that love Paris, London or Berlin. This little gem has absolutely nothing in common with any of these cities, because it is popular with Chinese tourists. And Chinese tourists are generally speaking just a bit different than Western tourists. First of all, they speak Chinese (duh! ), secondly most Chinese people actually are okay with doing physically challenging trips during their vacation, and physically challenging reaches a whole new dimension with Chinese tourists, that neither A nor I were aware of. We certainly weren’t aware of this when we finally found a travel agency, that spoke English (and when I say speak English, I mean they understood that we were looking for daytrips to see a bit of the countryside of Lijiang). We excitedly pointed at pictures, indicating that these trips seemed like something we could physically manage (this is Saturday afternoon, roughly 24 hours after our arrival, 7 days to go until our departure and we were counting!). After making up our minds and finding 3 day trips that we could live with and some price haggling we were somewhat content in our decision to give this honeymoon a try. Again, I am not quite sure how you imagined your honeymoon, you might be a daredevil for all I know, but neither A nor I expected to go into a second degree survival mode when planning our honeymoon. 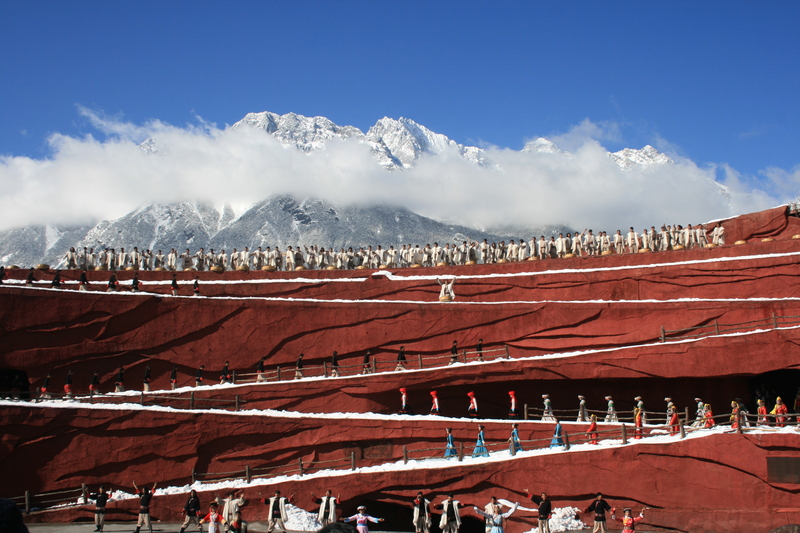 The first day trip was scheduled for Monday, which meant we had Sunday to look around Lijiang while awwing and ooing about all Lijiang had to offer. We quickly came to realize that every 4 squarefeet of street offered the exact same things: a jade and silver store, a (fake) leatherstore, a little eatery and a small travelagency, so walking around quickly became redundant, given that they all offered the same things with roughly the same prices. Monday couldn’t come soon enough. We were looking forward to getting away from the city and enjoy the countryside for a bit. That’s at least what we told ourselves. Little did we know, that the temperature would drop to unbearable degrees (which is silly coming from two people living in Oslo, but I guess we just really didn’t expect freezing temperatures on our honeymoon, especially given that the average temperatures in Lijiang in January are usually in the 60s). Fashionably late due to some communication issues, we were the last ones on the tourbus and realized, that we were the only Western people on the bus, which meant that we were lucky if anyone was able to communicate with us. The tour guide certainly tried his best to ignore us, unless he absolutely had to talk to us, but we didn’t mind. It just became a bit confusing when he handed us two oversized jackets, two bottles of water and two bottles of compressed air. But being somewhat curious, we didn’t mind (and didn’t ask) and decided to keep these gadgets on us, in case a survival situation would occur. Here is, what we got to see within the first 2 hours of our trip: The Jade Snow Dragon Mountain (apparently the people that named the mountain couldn’t decide what exactly to call the mountain…). Then we got packed into a bus to the Naxi Impression Show, which was the real reason we wanted to see the Dragon Mountain. 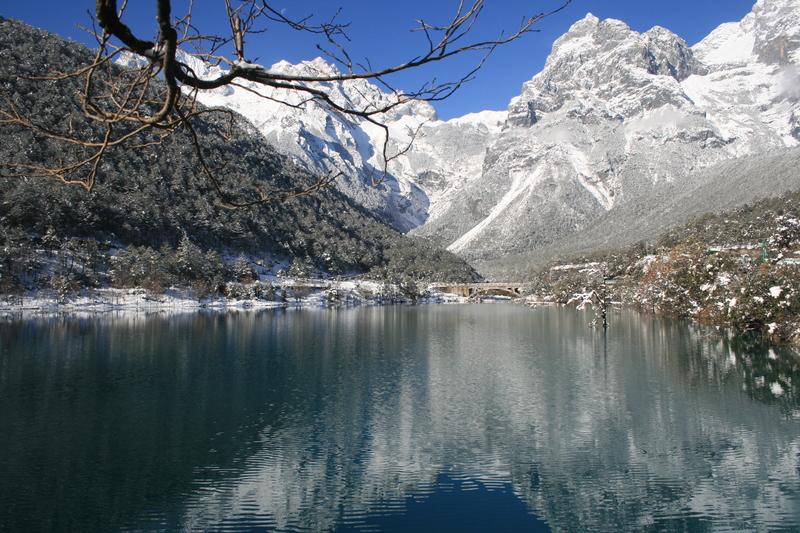 The Naxi are an ancient Chinese tribe that had lived in this area for thousands of years. And in order to preserve some of their heritage, they decided to put together a little show for the enjoyment of tourists. And an enjoyment it was. Neither A nor I could believe our eyes, what a great way to spend the day! The Jade Lake and the Impression show definitely were worth it on our book. At this point we were ready to head back to our beloved hotel and enjoy the rest of the day. Little did we know, that the worst was yet to come. No, literally. In the distance we saw a little gondola lift, laughing to ourselves, who would want to go up the mountain. The Naxi Impression show just taught us, that unhappy couples would try to climb the mountain (which is actually a glacier) just to fall to their deaths. Turns out, we were on our way to these gondola lifts and if you need to know: A is deadly afraid of gondola lifts. Well, not so much the gondola lift, but maybe the malfunction that could occur at any time when riding a gondola lift… Plummeting into the depths of the snow mountain. At this point it dawned on us, that the jackets and compressed air were not just some smart gadgets but actually a way to preserve our lives on that glacier. The 25 grueling minutes on the gondola were enough to send A over the edge. By the time we reached the top his face was as white as snow and his knees were shaking. But what we saw next quickly distracted A. 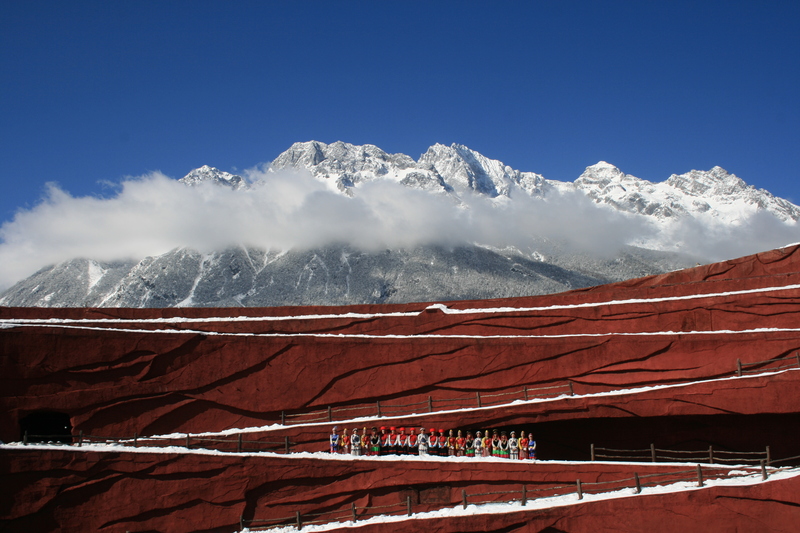 As we stepped out of the gondola we saw hundreds and hundreds of Chinese people playing with snow, as only little children play with snow (at least where we come from). Jumping up and down, screaming at top of their lungs, and taking a billion pictures, while Wham’s ‘Last Christmas’ played in the background. I couldn’t believe my eyes, because of that scene (also we were on a glacier, shouldn’t people at least try to be quiet to not trigger an avalanche?) and because what was in front of our eyes was clearly spectacular. The view was amazing, the whitest white that my eyes have ever seen mixed with the diamond blue that the weather provided us with and the sun glaring down at us. 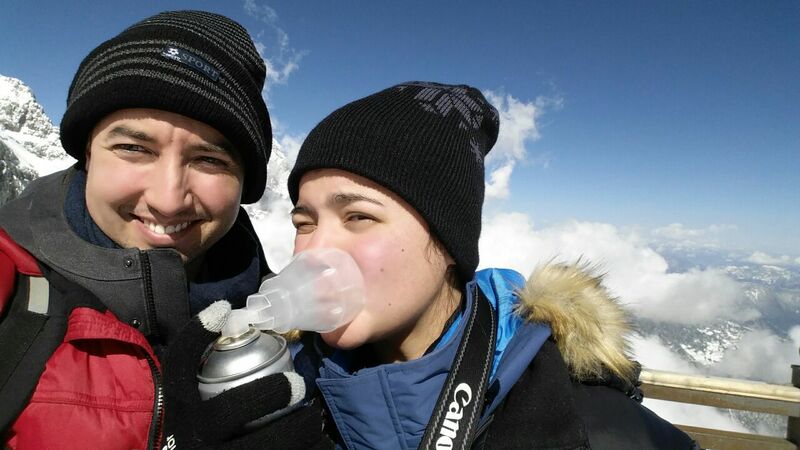 Having never been at such high altitude (15.000 feet) I didn’t know what to expect, but quickly realized that the compressed air was an absolute necessity. The thin air filled my lungs but however hard I tried to inhale, it just wasn’t enough, which left me breathless and close to fainting on numerous occasions. But however bad I felt, the girl that was sitting in front of us, on the way down from the glacier had it worse. Now imagine me, sitting on the gondola on our way down lightheaded, breathing heavily, holding A’s arm, as he had his eyes shut tightly, afraid of the gondola suddenly snapping and us falling 15.000 feet into the icy nothing. There was a sickish girl and her significant other sitting in front of us. He was holding tight on to her, trying to make her feel better, but how ever hard he tried, there was nothing that he could do. About 30 seconds before we reached the end of the gondola ride, I told A that he could open his eyes now, that everything was going to be alright and just as I finished that sentence, the girl made a sound that rang in our ears for hours to come. Despite her urge of revisiting her past meal, she was a real champ and kept it together, as we were counting down the seconds to reaching the final platform. And the instant the doors to the deathtrap of a gondola opened, she jumped out running towards the closest trashcan relieving herself of anything in her. Oh boy, the sounds that she made, horrific. After that, she somehow made it back safely to her pickup point and so did we. Somehow, we made it back to civilization and to our little hotel. Somehow we managed to patch the little holes in our walls, to retain what little heat we managed to accumulate in our room. Somehow I found out, that our bed had an electric heating blanket, that we used all night to keep ourselves warm, somehow, we survived this day. Just somehow.